Since there are many different brands of LED lights for kayaks, it’s nearly impossible to cover all the ins and outs of installing them all. 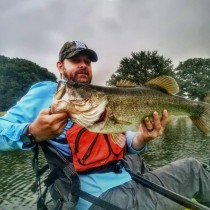 Instead of trying to tackle that, I’ve opted to give you some “tricks of the trade” from a guy who has installed more than a dozen kits for different kayaks. At the end of this article, I’ll link to an installation video from one of the more popular LED companies, Super Nova Fishing Lights. It seems like a lot of stuff, but to do a quality install all of these will come into play. Make sure you ask about parts included with the lights you buy, or the cheap lights can become more expensive quickly. Using 1” wide masking tape, find the center line along the side of the kayak. It will be almost a pseudo seam where the kayak starts to slant downward toward the ground. Place a strip of the tape right below that center line. When you mount your lights, mount them just below the tape. This gives your lights an angle that will reflect off the surface and penetrate into the water. Before adhering them to the kayak, I like to tape the lights into position with masking tape to verify lengths of wire needed, check operation and light angle with the battery, and verify the layout. With your lights taped up, mark a spot about an inch from the end of the strip with the Sharpie. I run my wires to the center of the kayak. Once satisfied with the mark, I use a 3/16” drill bit to make a single hole. Stay steady when drilling and don’t let the bit wobble, or you will have more to seal. When you get ready to seal off the holes, use the marine grade silicone. I like the clear. Silicone will run with gravity and not want to stay in one place, but with some moisture it will. With a wet finger you can manipulate silicone into a nice, neat form. Be aware that if a non-wet surface touches the silicone it will get stringy and sticky. Lots of moisture is the trick. Drying can take some time, and can be expedited with heat. My preference is at least 18 gauge marine grade wire for lights. Anytime I connect wires I solder the connections and then seal with heat shrink. This allows for firm, long-lasting connections. I connect switches and terminal ends the same way, with some solder. If you happen to run into a problem, labeling wires at the connection points can be a big help. I bring all of my wires together at the final connection point, bind them temporarily with masking tape, and then label them. This will allow quicker replacement should a wire become damaged or stop working. This is a video compiled by Mark Cisneros for Super Nova Fishing Lights. It walks you through the steps as owner Dez Davis does a light install.